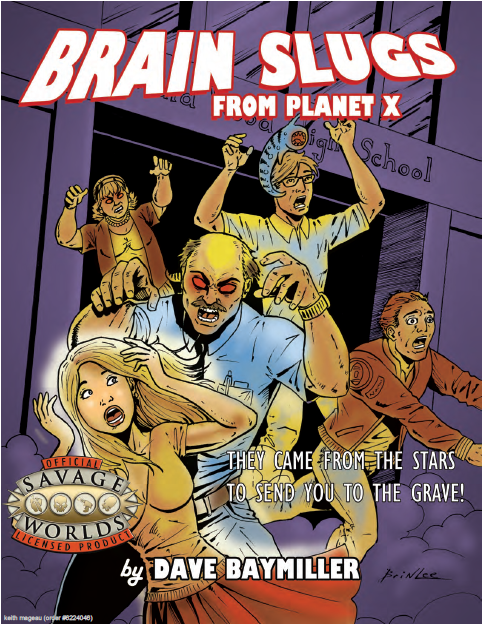 Recently, I was provided with a copy of Brain Slugs from Planet X, a campy and pulpy module, and a copy of Modern Floorplans – An Average Modern High School the accompanying map that it was designed to used with for the purposes of reviewing them. What follows is my review of the module and map, not from an actual play perspective, but from an analytic perspective. As a consumer I find it important to know what I am buying. I want to know what I will get with my purchase, more specifically how well it’s written, constructed or presented. Let’s first look at these very concepts that I find important. Dave Baymiller has done a fine job with crafting a campy, pulpy module that presents the information in a logical and readable way. He went so far as to include a short primer about the B-movie genre in the first few pages. This helped to get me grounded in the teen sleuth genre and set the tone for what came after. Since Savage World RPG modules are not written in the same manner as other systems, the writing itself takes on a different form and format. The story background information, to include a well detailed timeline, was well written and really took me in; it made me want to keep reading. The short blurbs about NPCs with the story-arc are packed with necessary information in a short and concise way with no extra “fluff”. Baymiller has really captured the feel of the classic B-movies and has gotten to the essence of those “meddling kids”. The module, at the present time, comes to you in PDF format. It is a 14 page water marked Document. Let’s start with the obvious. the cover. The cover is the only piece of color art within the module. It is nicely done and captures the feel of the teen sleuth genre. The internal line art is nicely done and evocative, but I wish there were at least one or two color art pieces within the module. The presentation of the necessary information like the archetypes, story background and NPCs are well laid out and presented in such a way that seemed intuitive when I read through the module. The module is more than readable with the fonts used. There is nothing in this product that is hard on the eyes. I am going to try not to give away any spoilers here, but after reading the module cover to cover I came away wishing there was just a little more information about how to bring in adults (police, teachers, parents et al) into the story mix. Let’s face it, many of the movies within this genre teens are the main characters and that concept is well captured in this module. It just seemed to me that there could have been a few hooks or ideas on how to successfully bring other adults into the teen sleuth story. I will concede to the point that the module itself is meant to be self contained within the high school and therefore the likelihood of introducing more adults, outside of those already within the school, is slim. This is just something I would like to have seen explored and expanded on, maybe as a set of story “alternatives” in say an appendix at the end of the module. Dave Baymiller has really captured the essence of the teen sleuth B-movie with this module. His writing style is easy to read, fluid and compelling. The presentation of the background information that is necessary to envelop the GM and get them grounded in this genre and story arc is well done and refreshing to see. While I am not a huge fan of this genre or “gonzo” games for you old school fans, this module makes me want to rethink my aversion to this genre of game themes. Where to start? This 46 page PDF is chock full of map goodness! The high school is comprised of two floors, baseball field, football field and the ever important parking lot. The PDF includes a detailed laboratory and a standard classroom. These are used as basic floor floor plans for classrooms. Furthermore, it contains two module classrooms, fixtures and furniture. Fabled Environments also enabled layering which lets owners of the product turn off and on several features like: square grid, hex grid, furniture, walls, text and cars and landscaping/parking lot. That’s a nice touch! For me, I don’t use hex grid, so I can just turn it off on favor of the square grid. The grid is set at 1″=5′. Any number of layers can be turned on or off depending on your personal preferences. The high school is broken down in several ways to allow for more functionality. First, the vignettes are perfect for “snap shots” of particular areas designed for home printing which makes the process that much easier. Enabling you to print what you need, when you need it. Second, the larger, more robust maps are great for online play. The sports fields are also presented in several formats: with or without grids (triggered by the layering) and also as vignettes. Parking lot, who needs a parking lot? You do! How many times have you looked at the modern maps out there and said damn, I wish they had included the parking lot? I know I have. Let’s face it, zombie attacks happen in parking lots 60% of the time according to the national study on zombie attacks. Well, this map set has you covered in this area! They included a well laid out parking lot that includes cars and landscaping, both of which can be turned off by disabling those layers. For me, one of the coolest things it the fixtures and furniture pages. They allow you to print and cut out the fixtures and furniture pieces to customize any room in the school. They are scaled at 1″=5′ to match the grid. I really appreciate the ability to customize and make something feel like it is my own. Without doing all the work! I find this product, much like the rest of the company’s catalog of maps, very useful for certain genres or games. I can see the map being a highlight of a zombie themed game or even a post apocalyptic game. This map set would be perfect as the backdrop in many of the games that encompass the Anime genre. 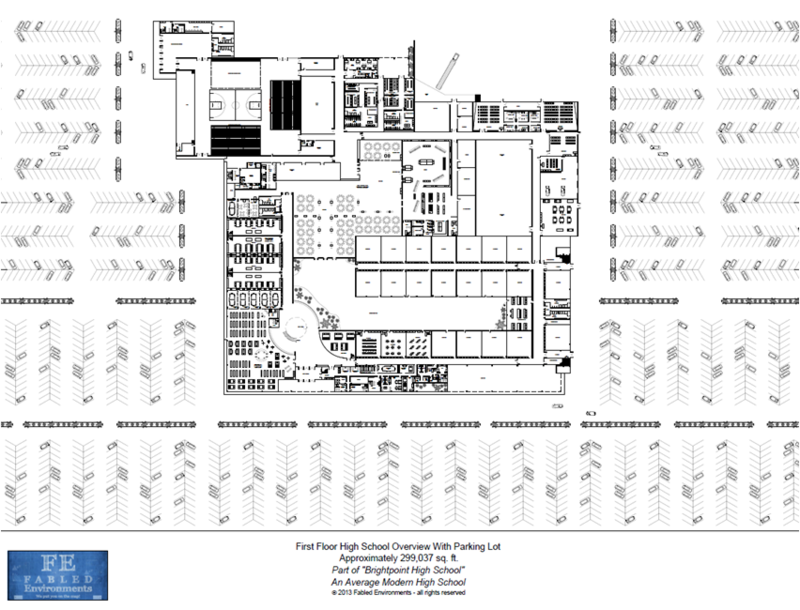 The larger sized maps (see example above) that encompass the entirety of the school building are perfect for use with Roll20 and Voice Over IP play. This is a feature I take advantage of with all the company’s maps that I use. The PDF structure itself, is super user friendly. They have enabled all the right features like bookmarks to easily locate sections of the map or vignettes. The layering is a godsend….. Need I say more? This is a great set of maps of a very cool looking school and surrounding environs. The architectural drawings are very well done and added features of the layering make this product user friendly. If you are planning to run any type of modern themed game, I would encourage you to check out this map set or any of the other map sets from Fabled Environments. They do a wonderful job! Let’s tie this all together! The module and the high school map work well together. There are two considerations here. 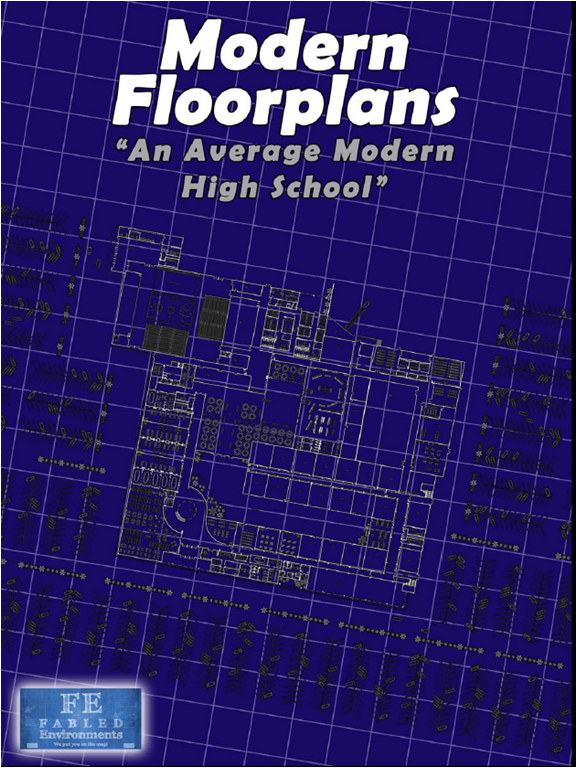 First, the module was conceived from the ground up to be used with this specific map and second, a high school is so appropriate for the theme. My last thought here is, who doesn’t love playing a game, any game, that takes advantage of miniatures on a sweet map! I am off to watch some B-movies on Netflix to get into the mood so that I can really rethink this genre and where it might fit into my gaming rotation!